Newcomers to Canada are becoming a stronger economic force based on their numbers and habits impacting a wide range of industries from groceries, banking and real estate to media and sports, according to our new Newcomers to Canada report. Earlier this year, we conducted the research among 1,149 newcomers from parts of the world representing the vast majority of all newcomers to Canada. Groups interviewed included newcomers from China, South Asia, The Philippines, North Africa and the Middle East, as well as Latin and Central America. Detailed interviews were conducted in Vancouver, Edmonton, Calgary, Toronto, Ottawa and Montreal in six languages. SRG also interviewed 966 Canadian ‘general population’ respondents for comparative purposes. The newcomer market is increasing in importance socially and economically because of a number of factors. One is their record numbers: in the last 10 years, over 2.6 million newcomers arrived in Canada – the largest number in any 10-year period since the 1960s. As well, newcomers are younger than the average Canadian population with median age of 31.7 compared to 41.2 for the Canadian population as a whole. They also live in households with more people, averaging 3.1 persons, compared to the 2.5 per household Canadian average. SRG is estimating that newcomers in the last 10 years represent household consumption expenditures of $62.4 billion on an annual basis, expanding to over $70 billion in the next 10 years. 52% of newcomers interviewed said they are renters currently, a much higher level than the overall population level of 39% renters in these markets. However, almost one-in-four (24%) said they are looking to buy in the next year suggesting they will continue to help propel the real estate market. Loblaw Companies has 41% share of the newcomer grocery dollars with their No Frills and Real Canadian Superstore banners responsible for the lion’s share of this total. When T&T is also considered, Loblaw Companies are particularly strong in the Chinese newcomer market (49% share). Costco has 16% of the newcomer grocery market, followed by Walmart at 12% and Metro Inc. with 12% share. It is notable that Costco and Walmart are particularly successful in the newcomer segment relative to their share of the general population. For example, Costco’s share among newcomers is 16%, 5-points higher than its share of the general Canadian population of 11% in these markets. 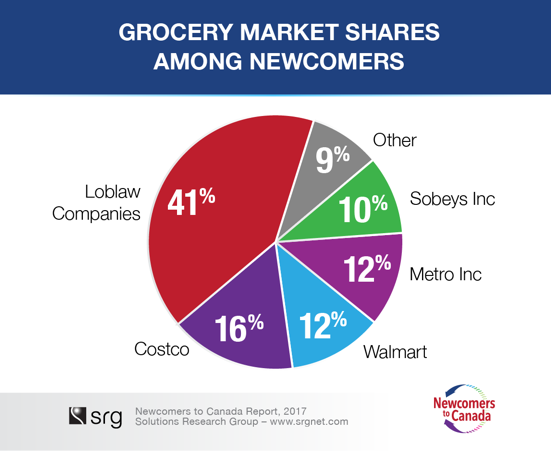 Sobeys Inc. has only 10% of the newcomers’ grocery dollars, much lower than its share of the general Canadian population of 18% in these markets. Grocery share among newcomers is important because newcomers are spending about 15% more on groceries than average on a weekly basis compared to the general population. The big 5 chartered banks have 79% of the newcomer market, with TD and RBC head to head (23% and 21% share of market, respectively) followed by BMO in the number three position. Compared to a similar study conducted by SRG a decade earlier, RBC, BMO and Scotiabank have significantly improved their market share among newcomers and Tangerine and PC Financial are also players in this market now. Canadian banks are doing a generally good job serving the newcomer market: 85% of newcomers say they would be likely to recommend their primary financial institution to friends, family and newcomers to Canada, with over half (51%) saying they would be ‘very’ likely to do so. When it comes to credit cards, 61% of newcomers use VISA and 52% use MasterCard, slightly above general population levels of use. The leading communications provider to newcomers overall is Rogers. Over half of all newcomers (52%) in these markets have at least one Rogers product (wireless, TV, Internet or home phone). In the ever-important wireless category where smartphones are universal among newcomers, Rogers’ Fido banner takes the top spot with 21% share and another 16% have a wireless phone from Rogers. Bell and Telus have 14% and 11% share respectively, and Freedom rounds out the top 5 with 10% share, followed by Koodo, Virgin and Chatr. 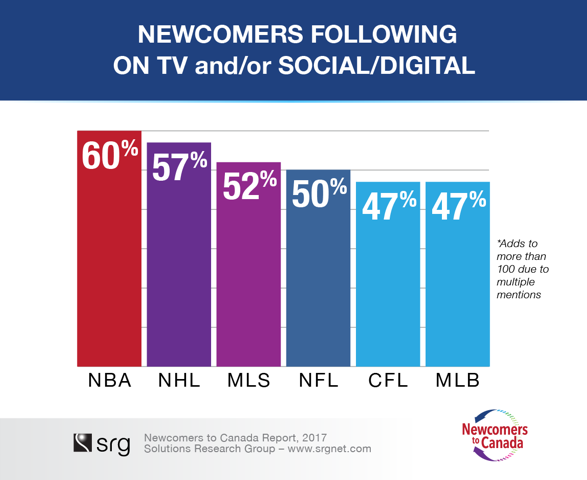 Newcomers are somewhat less likely than the general population to have a TV subscription, but even then three-in-four (76%) have a conventional cable or an IPTV or satellite TV subscription from Bell, Rogers, Shaw or Telus or smaller providers. 70% of newcomers consider themselves sports fans (similar to 68% of the general Canadian population), and 81% said they watched at least some of the last two Olympics in Rio and Sochi suggesting good level of engagement with sports. When asked to indicate their personal favourite sports, basketball comes out on top (29%), followed closely by soccer (28%) and hockey in the number three spot with 26% as one of their favourites. Cricket, swimming, football, tennis, gymnastics, badminton, and figure skating round out newcomers’ top 10 personal favourites. Newcomers were asked about their favourite sports and athletes – amateur or professional. Three of the Top 5 favourite athletes are basketball players and the other two are soccer stars. When it comes to watching on TV or following pro leagues on digital or social media platforms, NBA was ranked the #1 overall among newcomers. 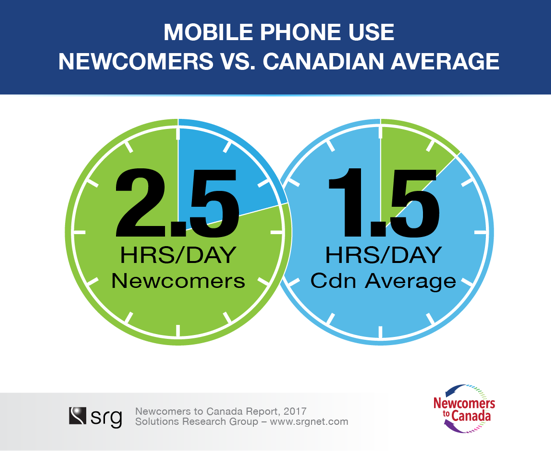 Newcomers to Canada are very mobile-centric: they reported spending 2.5 hours with their mobile phone ‘yesterday’ compared to only 1.5 for the general Canadian population. Newcomers from the Philippines were the most intense mobile users of any group, spending 3.3 hours daily using their mobiles phones for social media, messaging and video. Social, messaging and video apps are very popular among newcomers, with Facebook and WhatsApp mentioned as the top apps by two-in-three on an unaided basis, followed by Instagram and YouTube. Chinese and South Asian newcomers showed the most variation on this: Facebook and WeChat were the top apps among newcomers from China, while WhatsApp was number one among those coming from South Asian countries such as India and Pakistan. Research found that newcomers to Canada overall are more likely to be monthly users of Netflix compared to the general population. Over half (57%) of newcomers reported using Netflix in the past month. The heaviest users tended to be Spanish-speaking (61%) of newcomers from Latin and Central American countries. YouTube use is also nearly universal with 93% of newcomers saying they used YouTube for video in the last week. And FaceTime is also popular – newcomers were twice as likely (38%) to be using FaceTime weekly to connect with friends and family, compared to the general Canadian population (19%). Streaming music is popular, with 51% saying they used a service like Spotify, Google Play Music, Apple Music or Soundcloud in the past month. 77% of newcomers interviewed visited a website aimed at their ethnic background in the last 7 days, while 87% used websites aimed at the general Canadian population – so the newcomer media diet is a blend of ethnic and mainstream/Canadian media. Chinese newcomers were more likely than other newcomers to say they visited a website aimed at their background in the past week. 87% watched at least some TV yesterday via traditional sources or the Internet, spending an average of 1.7 hours. CTV, CBC were the leading top-of-mind ‘most watched’ TV channels, followed by Global. News is important to newcomers: CNN and CP24 (in Toronto) are in the top five channels mentioned. Over half of newcomers reported reading or looking into print media yesterday and mentioned at least one title they read or looked into in the past week – the free dailies are very popular, with city editions of Metro in the #1 spot among newcomers in all the markets surveyed. 24 Hours is also popular, in the top 3 in Toronto, Vancouver and Montreal. In the nation’s largest market, Toronto, Metro and Toronto Star are in the #1 and #2 spot among newcomers, followed by 24 Hours. 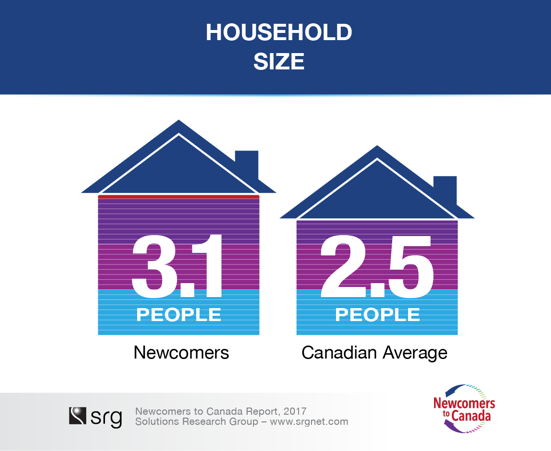 About the Study: Newcomers to Canada is an independent syndicated research study conducted and published by Solutions Research Group Consultants Inc. (SRG) exploring consumer behaviours, social attitudes and demographics of newcomers in the last 10 years (since 2007). The study covered newcomers from five major groups and geographic areas which account for a vast majority of immigration to Canada, as follows: Newcomers from China, The Philippines and South Asian countries such as India and Pakistan, newcomers from Middle Eastern and North African countries as well as those from Latin & Central America. To participate the respondents had to be 18 years of age and older and new to Canada, having arrived in the past 10 years and currently living in one of the following CMAs: Vancouver, Calgary, Edmonton, Toronto, Ottawa and Montreal. The results and figures in this post can be cited publicly, as long as proper attribution is given to Solutions Research Group.